Click the script's name to go to its description and download page. For macOS 10.12 and later/iTunes 12 and later only. This script will allow you to batch set or clear the Album Rating and/or Album Love/Dislike for the albums of the selected tracks or the albums associated with the tracks in a selected playlist (note that only a single track from any album need be selected in order to change the album rating or loved of the entire album). 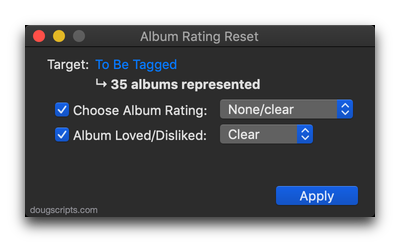 Handy for clearing batches of albums of their user-set album ratings, or re-rating batches of albums. Be sure to select at least one track of each album for which you want to change the Album Rating. For macOS 10.12 and later only. Performs a Google image search using an Album's name. Results are displayed in your default web browser. For macOS 10.12 and later only. This applet will play each track in the selected playlist and will wait (one might say insert but that's technically incorrect) a user-set number of seconds between each. Play can commence at the "top" of the playlist or from a selected track. NOTE: This script will only work as described when the "Up Next" queue is empty. You can use the "Clear" button" in "Up Next" to empty it of tracks. This is an issue with iTunes 12.2 and later. Select a playlist (or a track in a playlist) and then run the applet. 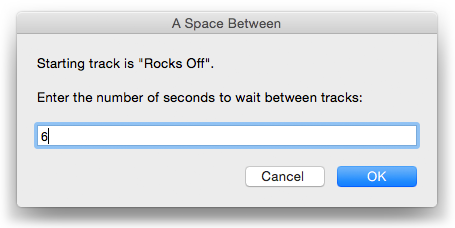 Enter the number of seconds to wait between each track. For macOS 10.12 and iTunes 12.5 and later only. 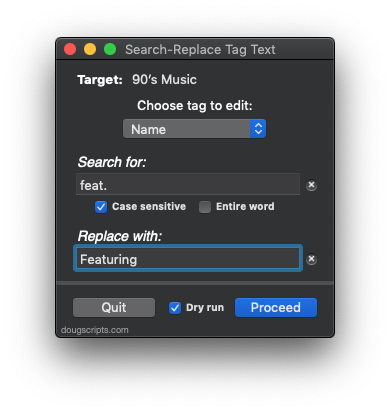 Performs a search-and-replace on the text in your choice of tag (Song Name, Show, Artist, Album Artist, Album, Composer, Comments, Genre, Grouping, Movement or Work) in the selected tracks or all the tracks in the selected Playlist. Features case sensitivity and whole word match options and dry run preview. It's a good idea to do a Dry Run to check the results before actually doing the replace. Use it free for 10 days. For macOS 10.12 and later only. This script will "refresh" the selected user-created Smart Playlists by removing the tracks they contain (if possible*) which then obliges them to dynamically repopulate, ostensibly with different tracks. *Note that tracks cannot be removed from a Smart Playlist which already contains every track of the library meeting its criteria--it would just repopulate with the same tracks. Smart Playlists with the "Limit to" and "Live updating" criteria in use are more likely to be "refreshable". 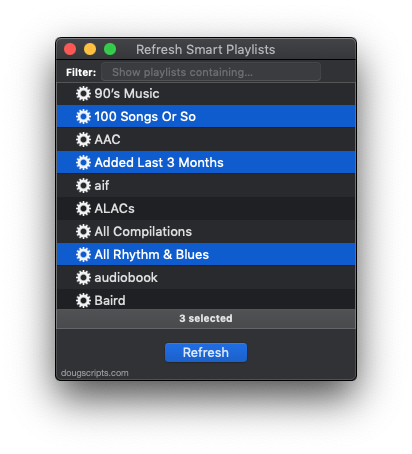 Click "Refresh" to repopulate the selected Smart Playlists. For macOS 10.10 and later only. 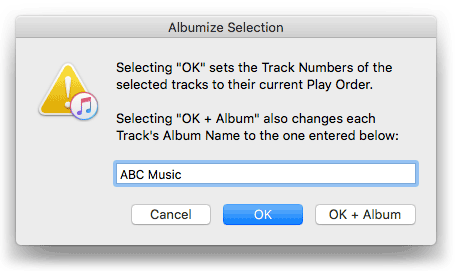 This script re-numbers the track number and track count tags of each track in a selection of tracks to its current Play Order and, optionally, applies a user-entered Album Name for every track. The selected tracks will be track-numbered 1 to 13, their track count tags set to 13 and each track's album tag set to the text entered in the text field. 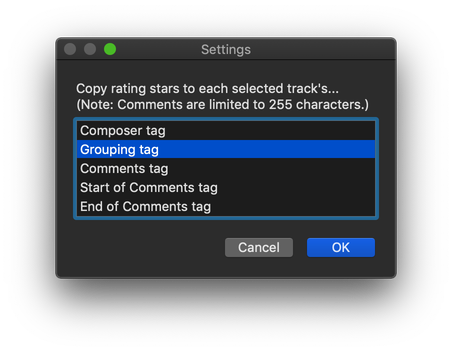 This script will convert the rating value (0-100) of a track to the appropriate number of stars as Unicode text and copy that text to the Composer, Grouping or Comments tag, with additional options to copy to the start or end of extant Comments text. This text will "travel" with the audio file, unlike the actual rating value. Choose where to copy the rating after it is converted to Unicode text stars. This script will export then re-import the artwork data of the selected tracks obliging iTunes to embed the artwork in the track's file's meta-data. For best results, use with an album's worth of tracks--or so--at a time. iTunes may be obliged to perform a number of background tasks when applying image data and may prevent the script from proceeding if a large amount of data is involved. 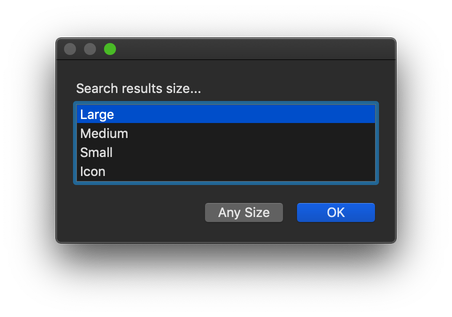 Note: this app does not affect how the Finder may or may not display a file's icon image. Also see Tracks Without Embedded Artwork. For macOS 10.12 and later only. 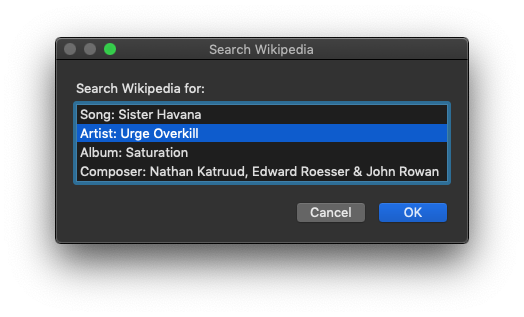 Performs a "Go" search of Wikipedia (like Google's "I'm Feeling Lucky") in your default browser using the Song Name, Album, Artist, or Composer tag of the single selected or currently playing iTunes track. OR if a radio stream is currently playing and the provider has formatted the stream title correctly, such that Artist - Song Name is displayed, the script will do a Wikipedia search for the Artist name. Select which tag of the selected or playing track you want to look up on Wikipedia. For macOS 10.12 and later. This script will assist with associating replacement files with a batch of dead tracks. iTunes can perform this task, too, but only one track at a time. The script will attempt to locate existing files (recursively) in a user-selected folder that have the exact same filenames and extensions as the missing files of a selection of dead tracks. Then, you can determine if the found files are viable replacements for the missing files and the script will perform the replacement. Replacement files remain in their current location and will not be copied/moved to the iTunes Media folder. This can be a delicate operation. In addition to the must-read documentation included with the script, I also suggest you read what I've written about using this script here.